Listed in the Scottish Borders Food Journey – order a print copy (free + p&p). It takes quite a woman to take one Jersey cow and make it into an award-winning transatlantic enterprise, but then Kelso’s Brenda Leddy, of Stichill Jerseys, is not just any woman. A recent runner-up in BBC Radio 4’s Food and Farming Awards, those familiar with the Borders food scene will be little surprised by her success. 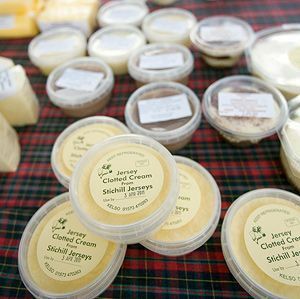 Something of an institution since she stepped onto the scene almost four decades ago, Leddy’s cheese, lemon curd, panacotta and cheesecakes are now staples in Dobbies across Scotland, as well as an array of Farmer’s Markets throughout Scotland. Lest we forget her clotted cream, for which she is the only maker in Scotland. Having started her business with just one Jersey cow, she now has over 100, with just a small team of herself, her daughter and two part-timers keeping things ticking over. ‘I know what we produce and I know that it’s good. We only produce things with no additives, only a little sugar or salt, and that’s what it’s all about. But it’s still nice when others take notice.' A stalwart of the Borders scene, the Yorkshire-born Leddy believes that people are more ready than ever for fresh, local produce. Although she’s considered a farm shop and developing an online business, you get the feeling both are a long way from fruition: ‘We’re too busy as we are and people find us anyway: we’re very lucky.’ Today she can stand alongside fellow dairy producers, such as Standhill Farmhouse Cheeses and the Orchard Farm Dairy as culinary forces to be reckoned. She’s clearly very proud. ‘I can’t bear supermarkets and no wonder. I get my pork from Purely Pork in Berwick, I love Puddledub Buffalo and get my lamb from a place outside Gourock, which rears them on heather. I can get everything from the markets, and I think more people are following suit. ‘The feedback I get is that people want good quality produce and want to know how and where it came from – we can give them that’. Brenda Leddy’s produce can be found in Dobbies outlets in Braehead, Livingstone, Aberdeen, Dunfermline, Milngavie, Stirling and Melville; she can also be found at Haddington and Edinburgh Farmers Market weekly. Looking for events in Kelso?